Located approximately 173 kilometres from Tennant Creek, Ali Curung is one of the communities receiving housing upgrades under the Stronger Futures for the NT (SFNT) funding and there is more to this project than a normal refurbishment. Morrow Builders saw an opportunity for the community to benefit even further by recycling some of the old doors that have been removed from the houses. During the works, trainees recycled and repurposed solid core doors from the houses into tables with bench seating. Repurposing the old doors into tables created a sense of community pride and has prevented waste going to landfill, whilst also providing practical skills and furniture for the homes. The project has been extremely successful so far. 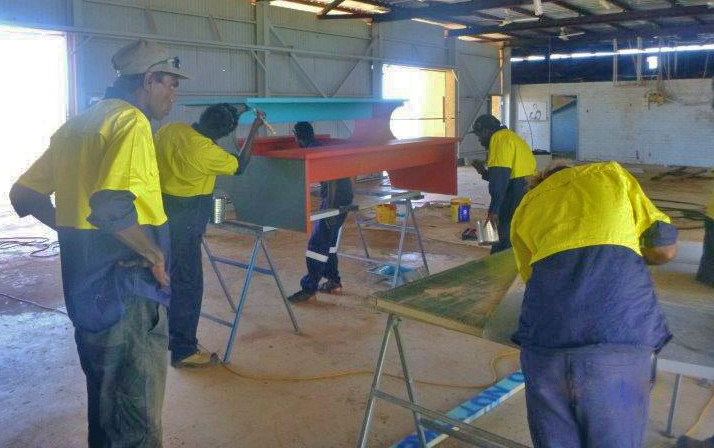 Eleven Indigenous trainees are working on the upgrades which include internal and external painting, tiling and electrical work such as installing fans, lights and power points. Some houses have also received new kitchens. On completion the trainees will have received training in practical remote housing maintenance skills which includes seven units of accreditation towards a Certificate II in Construction Pathways and Construction Induction White Card Training.